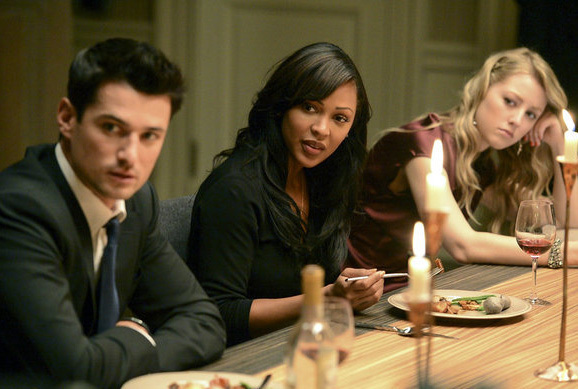 "Deception," NBC's new mid-season drama starring Megan Good, made its debut on Monday night. In the new show, Goode plays Joanna Locasta, a San Francisco police detective recruited by the FBI to go undercover among the family of her former best friend, socialite Vivian Bowers, who died of an alleged drug overdose. The dysfunctional Bowers family is made up of patriarch Robert (Victor Garber), sons Edward (Tate Donovan) and Julian (Wes Brown), daughter Mia (Ella Rae Peck) and Robert's second wife Sofia (Katherine LaNasa). Robert is the director of a pharmaceutical company and Edward is the company's chief financial officer. Julian is developing a cancer drug, but has a work-hard/play-hard mentality. Mia, who is a student, and Sofia don't embrace Joanna as much as the others and wonder why she's hanging around their family. Tim Goodman of The Hollywood Reporter wrote, " 'Deception' just seems sloppily constructed and poorly written, wasting some good actors (Victor Garber, Tate Donovan and Meagan Good) in the process and never giving you a reason to care. Matt Zoller Seitz of New York magazine wrote, "The most frustrating thing about this show is that it's more fun to pick apart than it is to watch. It lacks momentum and nerve, and it's sitting on a wellspring of meaning that it's too polite to tap." Rick Porter of Zap2it wrote, "There's a potentially rich, pulpy story lurking in NBC's new drama 'Deception,' and also one that could touch on issues of privilege, class and race if it wished." Emily Yahr of the Washington Post wrote, " Instead, 'Deception' falls prey to the exhaustive method of too-much-storytelling, adding layer upon layer of mini-mysteries and twists until the weary viewer needs a detailed map to keep track -- or turns off the show entirely.